Tomato vine leaves are being mixed with recycled cardboard to replace plastic food packaging at Waitrose. The eco-trays will be used instead of black plastic, which is almost impossible to collect and recycle. The move follows a successful trial at the supermarket using the waste tomato vine leaves last year. 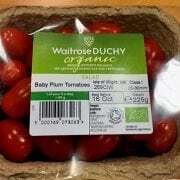 Waitrose Duchy cherry tomatoes will be sold in the special tray from mid-June. Waitrose’s other Duchy tomato lines will be in the new brown packaging from the end of July. Black plastic trays – used for everything from fresh produce to meat and fish – generate millions of tonnes of plastic waste a year. Such packaging cannot be identified by the lasers used to sift through rubbish on collection centre conveyor belts. As a result such items end up being diverted to landfill or burned for energy, rather than being recycled. In a similar innovation, pulses are being used in the packaging for Waitrose Red Lentil Pasta and Green Pea Pasta. This reduces the use of virgin tree pulp by 15 per cent and lowers greenhouse gas emissions by 20 per cent. In a separate major development, the food service giant Brakes, which sends out tens of millions of meals and other products to hospitals, schools, care homes, cafes and other food businesses is to stop using black plastic trays as part of a wider effort to tackle waste and pollution. The company said the decision was inspired by the Daily Mail’s ‘Turn the Tide on Plastic’ campaign and the recent national clean-up effort made by thousands of volunteers under the banner of the ‘Great Plastic Pickup’. Brakes will be looking into alternative materials for black plastic ready-meal trays and other packaging. It is also considering alternatives to plastic straws and cutlery. Environmental campaigners are encouraging people to give up plastic for a day as a protest over unrecyclable rubbish. The group, A Plastic Planet, is calling on families to avoid using items that contain plastic packaging today to coincide with it being World Environment Day.